American and Chinese officials negotiating a trade deal have resolved most of the outstanding issues but are still haggling over how to implement and enforce such an agreement, the Financial Times reported late Tuesday. Both countries have yet to agree on a number of important issues. Beijing wants Washington to remove existing U.S. tariffs on Chinese goods, while the United States wants China to agree to terms of an enforcement mechanism ensuring it abides by the deal, the FT said. Myron Brilliant, executive vice president for international affairs at the U.S. Chamber of Commerce told reporters that 90 percent of the deal is done, but the final 10 percent remains the trickiest part of the negotiations and would require trade-offs on both sides, according to the FT. The U.S. and China have levied tariffs on billions of dollars worth of each other’s goods since last year, which disrupted supply chains and raised costs for companies. 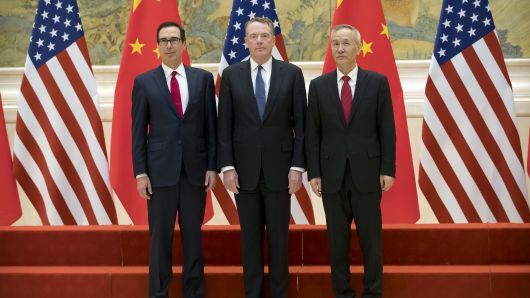 U.S. Trade Representative Robert Lighthizer and Treasury Secretary Steven Mnuchin are set to resume talks with Chinese Vice Premier Liu He on Wednesday, days after both sides reported progress in talks that took place in Beijing. If the discussions prove fruitful, the FT said it’s possible that U.S. President Donald Trump will meet with Chinese president Xi Jinping to formally sign an agreement. In the event the world’s two largest economies are unable to reach a trade deal soon, some analysts have warned that a global recession could follow.